The ex Miss Universe and the Playa Limbo concert were at the Hard Rock Hotel Vallarta; Punta de Mita was the latest go-to spot for a couple of Beverly Hills A-listers. Lupita Jones, the first Mexican Miss Universe back in 1991 and now manager of the Nuestra Belleza México contest spent a long vacation in the state of Nayarit, ending her getaway with a stay at the Hard Rock Hotel Vallarta (HRHV) in the Riviera Nayarit. Lupita visited several spots in Nayarit with her boyfriend, Marco Bautista Aragón, during her birthday celebration stay, including the Laguna Santa María del Oro, Ixtlán del Río, the Magic Town of Jala and the capital of Tepic, where she experienced the Huichol culture. Meanwhile, the Mexican pop band Playa Limbo headlined the Cosmo Bikini Bash at the HRHV. 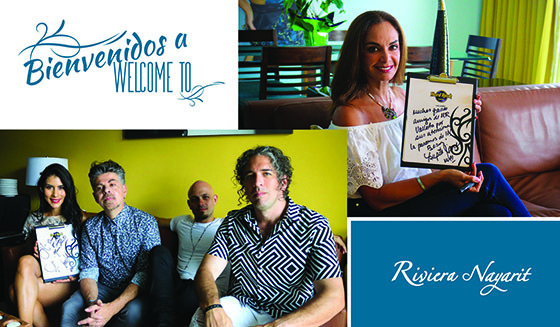 This is the event’s first year, and the group’s beautiful lead singer, María León, was honored as its godmother. The members of Playa Limbo said they were very well taken care of at all times, going public with their thanks with shout outs to several hotel staff members who were in charge of making sure they had an unforgettable stay. The celebrities were also very accessible to their fans during their entire visit. American actress, TV personality and writer Kyle Richards, known for her participation in the reality show, The Real Housewives of Beverly Hills, spent a few days in Punta de Mita and shared her stay on social media. She has 1.5 followers on Instagram. Brendan Fitzpatrick was one of the first participants of E! Entertainment channel’s Rich Kids of Beverly Hills reality show. This wealthy young man showed off his good time with friends in a pool located somewhere on the Riviera Nayarit’s Glamour Peninsula. He has 274 thousand followers on Instagram.